Would you recommend Slack Themes to a friend? Hi all, maker here. This was a fun weekend project to scratch my own itch. Feel free to use, share and contribute. I'd be happy to answer your questions. @paracycle Very nice work. Accepting contribution by pull requests I guess? @mgrouchy I sure do. Most of the project is Middleman boilerplate and the list of themes are stored in a single YAML file. Feel free to add themes and/or make improvements. Very cool! It's great to be able to preview them before applying them yourself. @patrickleeadams Thank you Patrick. That was exactly the problem I was trying to solve; happy to hear that it works as intended. 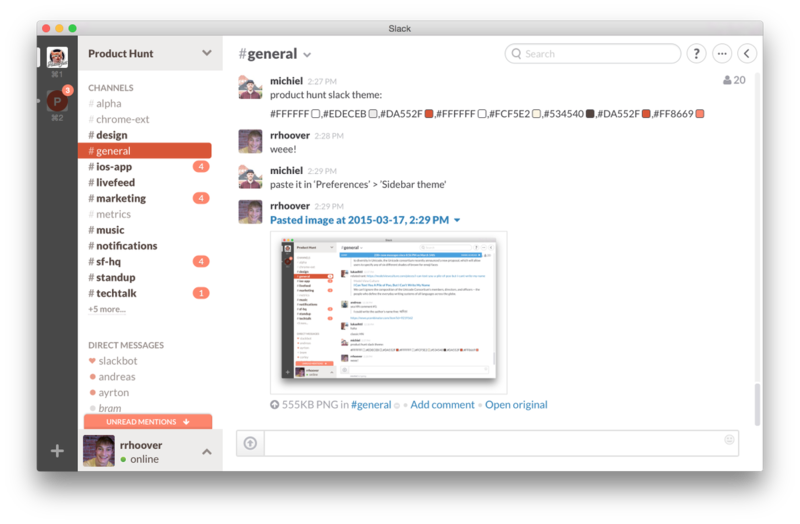 @xxxxxxiao Cool theme, I added it and pushed it out: http://slackthemes.net/#/product... Currently you have to make a Pull Request on Github to add themes. @paracycle I see. Great job! Loving this. Personal branding theme for developers.